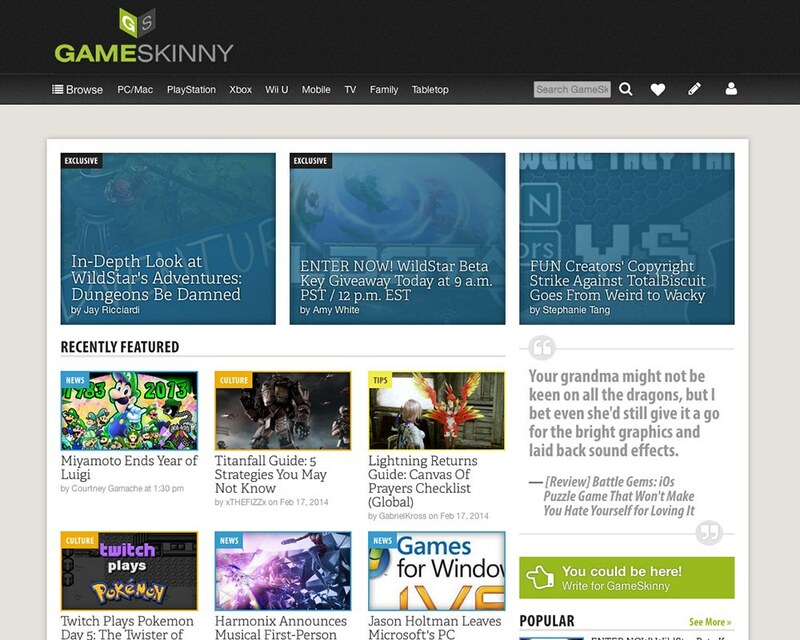 GameSkinny is a community for gamers and writers looking to break into game journalism. Anyone is welcome to post articles, slideshows, and events, and they are given helpful feedback from professional editors. The best content is promoted to the homepage. Readers can follow their favorite writers, games, platforms, or tags for news tailored to their interests. I enjoyed wearing multiple hats in this role. While my primary responsibility was focused around creating an engaging experience for both writers and readers, I also built much of the front end, wrote content, and even edited occasionally. Ran A/B tests using Google Events to track what messaging worked best for writer acquisition. Tested new features remotely with writers and editors. Designed the look and feel of the site, from the reader-facing articles and categories to the platform for writers and admins. Helped define the information architecture of the site. Sprinkled in moments of delight through animation, microcopy, and interactions. Coded the responsive front end of the site. Worked in views, controllers, and occasionally models in the PHP Zend framework to connect the right content to the right places. Wrote geek-centric microcopy and marketing copy to attract potential contributors and readers. Created helpful guides for new writers on using the site and building an audience. Dipped into the editing queue to assist when the editorial staff got swamped. Piloted the Gamer Gift Guide, a collection of articles around gamer-centric swag, books, and more for the holidays. Instead of placing a giant anxiety-inducing numbered badge on the GameSkinny menu, the profile icon changes to blue with a subtle pulse like a heartbeat when there are updates. When a user performs actions that reward points (like following someone or commenting), their profile icon will flash yellow and their points earned will pop down briefly. Users follow their favorite games, platforms, tags, and genres to get just the game news they’re interested in from their stream. Clicking on the Edit icon flips the widget so users can search for new things to follow or refine what they already follow. Canceling or saving flipped the widget back over. Users can sign up for newsletters about specific platforms, games, categories, etc. so they can quickly subscribe only to topics that interest them. The copy on the signup widget uses Star Trek references as a geeky inside joke, and after clicking the button, the entire widget spins downward as though the click had weight. helped readers get news and info on just the games and platforms they were passionate about.